January Update and 2019 Plans! I’ve been thinking hard about my art goals for this year, and working on a plan to achieve them. My main goals right now are to do some Toronto conventions, design some exciting new merchandise to sell, do at least one art zine in 2019, and do all 31 days of Inktober around a single theme, then release it as a book. First up, I applied to a few conventions. I am excited to announce I’ll be at Pretty Heroes Con in Toronto! I’m waiting on the applications for a few more cons, and when I have those figured out I’ll make a more formal announcement. I’ve also decided to design a line of acrylic keychains, and I’m working hard on those right now. 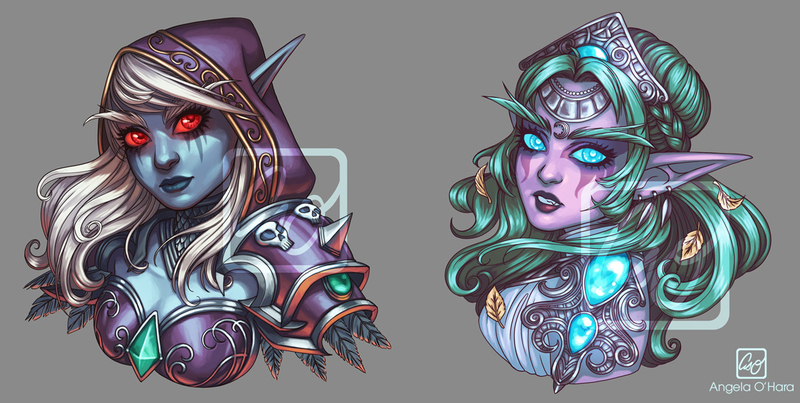 I’ll be doing 5 Warcraft characters, and I have 2 designs completed (above). I also want to do some stickers with those designs, and I’m excited to see how they sell. I have a lot of work to do to achieve my goals this year, but by starting early and working steadily, I believe I can do it! Angela O'Hara © 2017. All Rights Reserved.